The University of Washington’s Board of Regents has selected longtime UW professor and administrator Ana Mari Cauce as the UW’s next president. Breaking a long-standing tradition of picking outsiders to lead the University of Washington, the Board of Regents on Tuesday chose longtime UW professor and administrator Ana Mari Cauce as the university’s next president. Cauce, a 29-year employee who climbed the university’s ranks from assistant professor to interim president, joins a rare group among those tapped to head major American universities: a president selected from the inside. Her selection — solidified with a unanimous vote and a standing ovation inside a packed boardroom in the UW’s Suzzallo Library — surprised almost no one. Personal: Born in Cuba, left with her family during the revolution when she was 3. Grew up in Miami. Education: Degrees in English and psychology from the University of Miami in 1977, Ph.D. in psychology from Yale University in 1984. Work history: Joined the UW in1986 as assistant professor of psychology. Held numerous UW leadership positions, including director of the Honors Program, chair of American ethnic studies, chair of psychology, executive vice provost, dean of the College of Arts and Sciences, chief academic officer and provost. Appointed interim president in 2015. “We all think that Ana Mari is exactly the right person to lead the University of Washington today and into the future,” said board Chairman Bill Ayer, before regents approved Cauce’s appointment. By all accounts, Cauce, the UW’s interim president since March, emerged as the runaway favorite during a selection process that included nearly 70 nominations for the university’s top post, UW officials said. Regents, students and faculty representatives roundly praised Cauce Tuesday as a forward-thinking collaborator with a deep commitment to the university that prepared her to lead it in a way no other candidate could. After the announcement, Cauce said the rarity of her appointment made it extra meaningful. As president, Cauce vowed to continue building upon her long-established relationships with lawmakers, faculty and staff, and said she planned to broaden the UW’s reputation as a “a collaborative space” for higher learning, research and development. Cauce, 59, succeeds former President Michael Young, whose abrupt departure in February to take a higher-paying gig as Texas A&M president left many on the UW’s governing body longing for a leader who wouldn’t use the president’s job as a steppingstone to a position elsewhere. As president, she’ll be the first woman appointed to permanently head the state’s largest college, and the first Latina to sit in the president’s chair. Cauce had been temporary placeholder in the top post since March, when regents appointed her as interim president while launching a nationwide search. A search committee was formed and a headhunting firm hired; it identified nearly 70 nominees. Fifty-eight of them applied, and by summer’s end, the search committee narrowed its list to 29 prospects, said Kenyon Chan, UW chancellor emeritus, who chaired the committee. The finalists included 17 sitting college presidents or chancellors, nine provosts and three non-university nominees, but Cauce quickly separated herself, Chan said. “It was an outstanding pool of applicants, but Dr. Cauce just matched the criteria that the search committee had identified for the job so wonderfully,” he said. During the search, Cauce (pronounced “cow-say”) — who had carefully avoided calling herself a candidate — won widespread internal support for the job, with students, faculty and staff praising her as an approachable collaborator, a workaholic devoted to the university’s issues, and a decisive leader unafraid to take risks. Cauce, who said she planned to continue teaching even while serving as president, added she would have stayed at the university even if she had been passed over for the top job. “I plan to retire in this state, this city,” she said. Born in Havana, Cuba, Cauce grew up in Miami in a family that fled the island nation during the Cuban revolution when she was 3. Her parents worked in shoe factories while hoping to one day return to Cuba. Cauce earned degrees in English and psychology from the University of Miami, and a Ph.D. in psychology, with a concentration in child clinical and community psychology, from Yale University. She came to the Northwest about three decades ago, joining the UW’s faculty in 1986 as an assistant professor. Cauce and her wife, Susan Joslyn, live near Seattle’s Nathan Hale High School and own a second home in Friday Harbor. “I think the importance of being a role model is not at all trivial,” Cauce said Tuesday. With her research and expert acumen in her disciplines, Cauce, a professor of psychology and American ethnic studies, won academic fans and garnered numerous awards, including the Distinguished Teaching Award, the UW’s highest faculty honor. Cauce has held various leadership positions, including director of the UW’s Honors Program, executive vice provost and dean of the College of Arts and Sciences. Named provost in 2011, Cauce was responsible for managing the UW’s $6 billion budget, deciding which programs got funding and which didn’t. With an informal demeanor described by some as warmhearted, Cauce acknowledged she doesn’t fit the mold of the polished and pressed modern university president. “I think the issue is not so much as being an insider or outsider, but more of a question of known value,” said Ed Taylor, a UW vice provost and dean of undergraduate academic affairs. 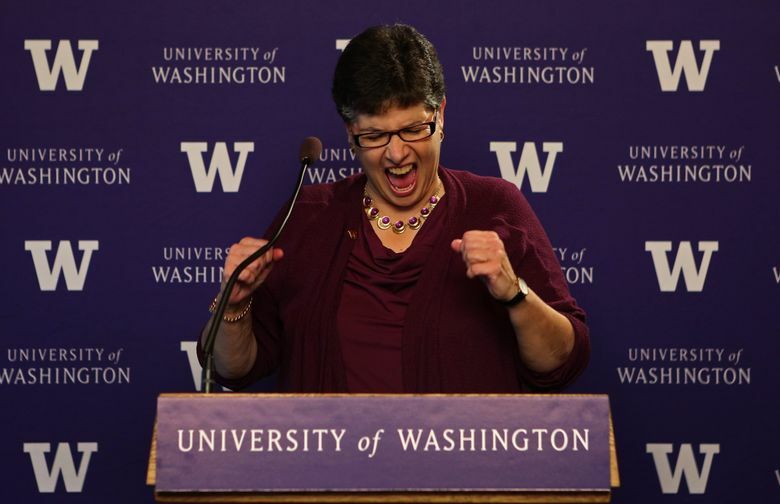 During her tenure as interim president, Cauce has spoken out against racism and homophobia, talked of supporting efforts to diversify the UW’s faculty and staff, and committed to providing more child care near campus. At times, Cauce also has clashed with some groups at the university. She recently disappointed some professors by sending an open letter expressing reservations about a move to unionize the faculty. Cauce, who currently earns $524,784 as interim president, will immediately begin negotiations with regents on a new “equitable and competitive” compensation package, board Chairman Ayer said.